A video screen is built into the print. It plays video messages and with its built in speaker sound too. 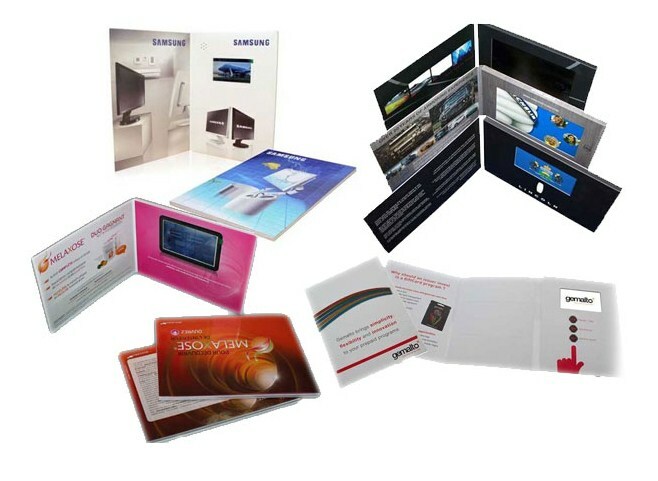 All incased in a full customizeable printed brouchure, with either soft or hard covers like a book. By using a magnetic switch, video starts playing automatically when you open the card. Different buttons alow for different video selection and volume control up and down. With video playing technology through a LCD screen, Video brochure can not only bring you static information, it bring to your client video and sound. Can the video be changed? Just connect the video card to your computer using the cable provided and it is as simple as copy and paste.